... create an interactive dive log and re-experience your dive after surfacing. 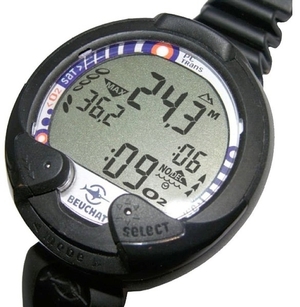 A dive computer is an electronic instrument which supplies the diver with all the necessary safety information. These devices, worn on the wrist, mounted in a console or with integrated tank pressure gauge connected to the regulator, can replace some or all of the instruments normally carried by a diver. At a minimum, they indicate depth and dive time. They use a dedicated algorithm to compute maximum dive time, ascent rate, decompression stops and necessary surface interval between dives. Other possibilities include compass, thermometer and dual air/nitrox use. Choice will depend on typical dive profile. Not all are programmed for unusually deep or mixed gas dives. The presence of a compass is especially useful in murky water or for night diving. Air management can be included via a physical or wireless connection to the regulator fist stage. Another option is a shore computer interface for data storage or programming. Some models can even send distress signals.